Hmmm what does the future of travel look like for you? I think Marriott are pretty spot on with this infographic they did based on travellers. With all the travel I do these days I often wonder where will I be in 5 years time, or 10 or even 15. Have you ever wondered where humans will be in the future? Will we be travelling into space or sleeping in underwater hotels? I mean space is definitely on my list, as long as it didn’t take my whole life to get there. There are lots of interesting viewpoints from like-minded travellers, but where do I sit on the spectrum for the likelihood of these future travel destinations? These can already be found in a couple places. I’ve cruised a lot, but staying under the water kind of freaks me out. 40% of travelers think underwater hotels are going to be more pervasive in the next 15 years. The idea of colorful fish floating by and the peace of that aqua blue color are enticing, but then what if I see a shark? Just before I close my eyes? Eeep! 35% believe space is a future travel destination. I mean if Richard Branson can do it, why can’t we? Flights went from being for the rich and famous to the everyday man with the commencement of the budget airline so why not have a budget rocket? It might take longer than the rich man’s rocket, and have less legroom, but hey – it’s space! Take me. While we are on the subject of far-fetched future travel let’s talk about flying cars and transatlantic trains. As much as this would indeed make travel so much more accessible to those of us who hate flying, and hopefully cheaper, realistically Back To The Future convinced us that flying cars were just around the corner and we still don’t have them. 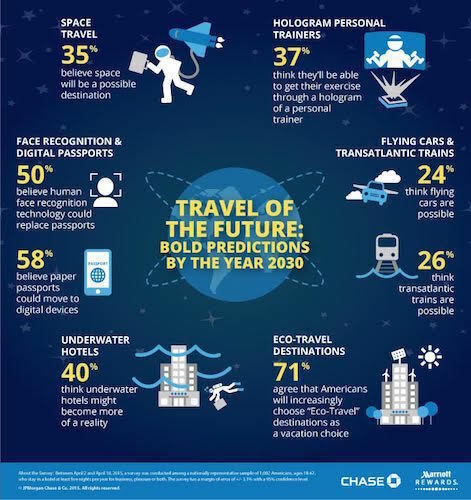 So have to agree with those surveyed on the skepticism of this future travel wish. 71% of travellers agree that Americans will start choosing Eco-Travel destinations for future vacations. We have already seen a dramatic shift towards this in 2015. SeaWorld seems to be fighting a constant battle as do other dolphin swimming experiences and elephant rides. Travellers are gaining more insight into the animal kingdom and what planet earth needs to stay alive that I have no doubt Eco-Travel will continue to grow in the future. Now I don’t know how close we are to this one, but it needs to be done. For those of us who travel on planes 20+ times a year, immigration and custom lines are the bane of our existence. With 58% of travellers believing passports could be digital or that human face recognition technology could replace passports all together (50%), I say why not? Bring it on! So maybe underwater hotels are not my cup of tea, but I would love to see the future of travel move to a more unique hotel experience. 51% of travellers believe private huts in the ocean or zip lining to a tree house are a possibility. For my honeymoon I stayed in a hotel, which required a cable car to go up a mountain to get to my room. Now if I could zip line to my room or even bounce to it via a series of trampolines, well that would be awesome. If you are not sure who organized this insight into the traveller’s mind then you should check out Marriott Rewards Credit Card from Chase. Their credit card allows you to earn Marriott Rewards on all purchases to help you get the most out of your travel. Who doesn’t like earning points to spend on their next vacation? No crystal ball is required to answer that one. Visit Marriott Rewards Credit Card to learn more. What are some of your ideas for the future of travel? I would love to hear them, comment below your wildest Back To The Future fantasy like hover boards or perhaps you have more serious, well thought-out suggestions. This will be a great time capsule, so come back in 2030 and re-read this after riding your hover board. Luke Dean loves adventure and excitement. When he is not travelling the world he is busy thinking of which destination will be best. This is a sponsored post written by Luke on behalf of Marriott Rewards Credit Card from Chase for IZEA. All opinions are 100% his.